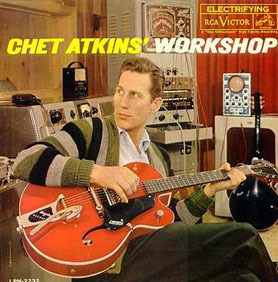 One of the main architects shaping the direction of modern country music, Chet Atkins maintained a reputation as a leading producer, performer and talent-spotter throughout the course of his career. Initially a fiddle player, Atkins had switched over to guitar by the time he had completed high school; his earliest work was for Tennessee radio and as a member of The Dixie Swingers. By 1946 he had moved to Cincinnati for another in a series of radio jobs, and it was this same year that he made both his first recordings and his first appearance at the Grand Ole Opry. Over the next few years he moved regularly to follow new work opportunities: first to Springfield for more radio, and then to Denver to perform with Shorty Thompson and His Rangers. Meanwhile, RCA had taken an interest in his recordings and was trying to track him down; while he was working in Denver they finally did, and Atkins immediately moved to Nashville to record. His first records with RCA were not particularly well-received, but the label's executives held firm in their belief of Atkin's potential; by 1949 he was the studio guitarist used for all of RCA's Nashville sessions. Also during this time he began working as a regular at the Opry, backing different members of The Carter Family. At the onset of the 50s Atkins focused his attention on his session work, becoming a consultant for RCA in 1953 and developing his reputation as a recording artist. His own records had been steadily growing in popularity, and by 1955 he had his first hit in the form of a version of Mr. Sandman. In 1957 the manager of RCA Nashville moved on to New York, and the guitarist was appointed to take his place. Through his production work during the late 1950s and the entirety of the 1960s, Chet Atkins played a major role in creating what came to be known as the 'Nashville sound', as well as being largely responsible for establishing the Nashville area as a major music center. He produced sessions for significant artists such as Elvis Presley, Waylon Jennings, and Charley Pride, in addition to arranging the first contract for the The Everly Brothers and overseeing the production of many of their hit songs. With the country music scene now beset by the onslaught of rock & roll, Atkins introduced high production values and lush string arrangements into the mix to broaden the music's pop appeal and lose the 'hick' association of the past. By 1968 Atkins had become vice-president of RCA's country division. Still working as a recording artist, he released his final hit single, Country Gentleman the following year. The guitarist's subsequent recording output during the early years of the 1970s was primarily done as a member of The Nashville String Band, a collaboration with his old radio partners Homer and Jethro. Another collaboration later in the decade would result in some of the most interesting music of his career: the 1975 album Chester and Lester, recorded with fellow guitar celebrity Les Paul. In 1973 he became the youngest musician to be inducted into the Country Music Hall of Fame. After more than four decades at RCA, Atkins finally jumped ship in 1982 and signed with Columbia: he had been pushing to record a jazz album, but his old label was not supportive of the idea. At Columbia, Atkins once again resumed his prolific recording career, but with the emphasis now on jazz rather than the country music that had established his reputation. He died in Nashville in 2001 following a protracted struggle with cancer.